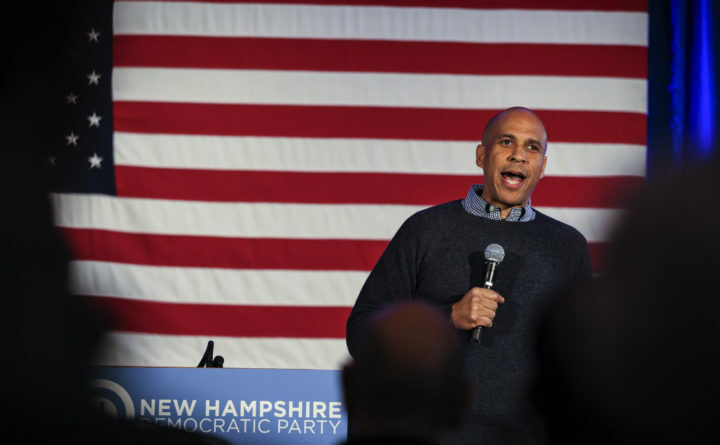 U.S. Sen. Cory Booker, D-New Jersey, speaks Saturday at a post-midterm election victory celebration in Manchester, New Hampshire. Booker spoke with the AP at the Riverwalk Cafe in Nashua, his first stop in New Hampshire this weekend. He huddled for nearly an hour with two top local Democrats — longtime Mayor Jim Donchess and state Sen.-elect Cindy Rosenwald. Also accompanying Booker at the cafe and throughout the weekend is Jim Demers, a leading New Hampshire-based Democratic strategist who’s backing the senator if he runs and who helped plan the trip’s itinerary. Demers was co-chair of then-Sen. Barack Obama’s 2008 campaign in New Hampshire, guiding the future president through the state.